Work zones are loud places! Communication between workers is crucial for a couple reasons, the first being safety. Wireless radio headsets are the only solution. That’s why Royal Innovative Solutions is the only distributor of Speak Easy Communication Headsets. 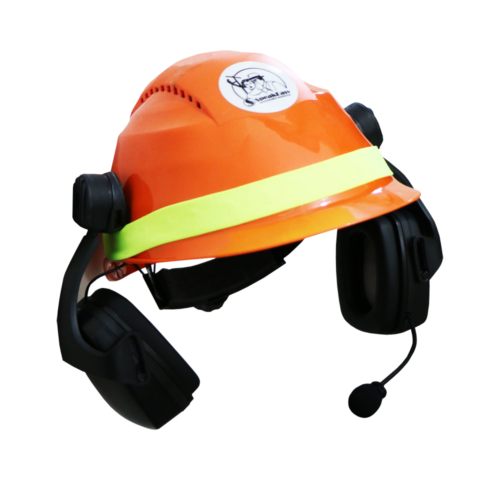 These headsets allow for safe and efficient work zone communication in any type of environment. They’re especially useful for traffic control operations. Flaggers at the front of the work zone can easily communicate with flaggers at the end of the work zone to keep traffic flowing safely. Yelling over handheld radios can be very difficult to manage, especially over loud noises and hearing protection. Instead, the Speak Easy headset offers built in hearing protection, filters outside noises, and allows for concentration on the task at hand. Speak Easy Communication headsets are designed with leading-edge digital, noise-filtering communication technology. Our capability is unlike any other on the market. Our units use an algorithm based on a unique sound-sample that Speak Easy teamed with Vertix™ Global to create. The way our units block out low frequency “heavy industry” noise makes this technology stand apart from other offerings. It removes the low grumbles, engines, chainsaws and other interference that often makes communication impossible on many work sites. Don’t risk your hearing. The Royal bundle is a combination of one basic Speak Easy headset and one Industrial pre-wired helmet ear muff combination. Included in this bundle is the split tail option for auxiliary power. This set was together for traffic control operations. It’s ideal for work zone communication! The driver can talk to an operator working off of the back of the cone placement truck.